Updated: September 1st 2016 The Long Haired German Shepherd is a rare sight for many since the gene is recessive and is known to be a genetic fault. 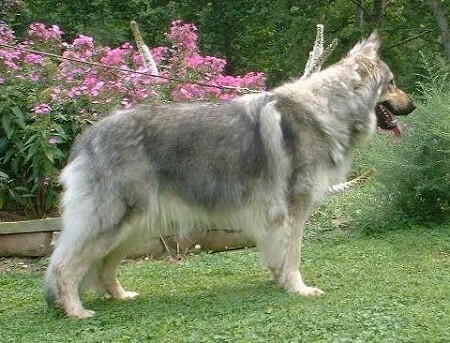 Even two short haired German Shepherds can produce longhaired offspring if the gene is present in their DNA. While these rare long haired dogs might be the result of genetics, they are becoming increasingly popular with dog owners. 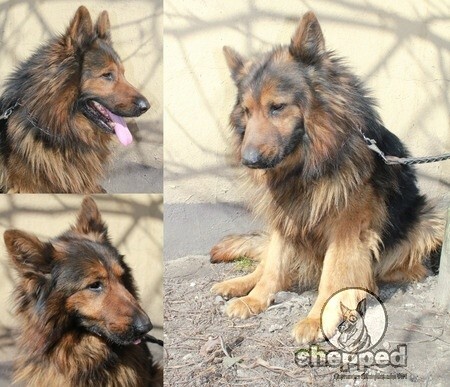 Some dog owners prefer a dog with fluffy long hair, and the long haired German Shepherd does not disappoint. Their long hair coat can come in any color within the breed. While their long hair makes them look a bit different and unique when compared to the standard short hair German Shepherd, underneath all of that hair they are actually similar. They have the same facial features and body type. Male long haired German Shepherds grow to the height of 24 to 26 inches and can weigh 66 to 88 pounds. Female long haired German Shepherds are smaller in size when compared to the males and grow to the height of 22 to 24 inches and weigh 51 to 73 pounds at a healthy weight. The visible difference remains the length and texture of the hair. Since the long hair German Shepherd does not have an under coat like the standard short hair does, the actual hair appears to be shinier. While this may look beautiful, it actually results in less protection from weather conditions. Due to their lack of protection against the elements, the long haired German Shepherd is not a good worker for herding and hunting. Dog owners will be impressed by the eagerness and obedience of the long haired German Shepherd. It is well known that the long haired GSD has a better temperament compared to the standard German Shepherd. Although the standard GSD does not have a bad temperament, the long haired has an even better one. Another noticeable difference is the long haired GSD prefers to be in constant contact with their human family. Therefore these dogs make excellent indoor dogs as long as they are exercised properly. They are highly playful and enjoy playing with toys and their family members. They are also extremely loyal to their human family and show bravery when confronted with situations that require them to protect against harm. Their playful and protective nature makes them excellent playmates for children and even better babysitters. The long haired German Shepherd suffers from identical health issues as the standard German Shepherd. Common diseases include hip and elbow dysplasia, epilepsy, eczema and digestive problems. Although hip and elbow dysplasia is usually a genetic health issue, the other issues can be caused by careless breeding practices which make the breed prone to suffer from a variety of hereditary diseases. 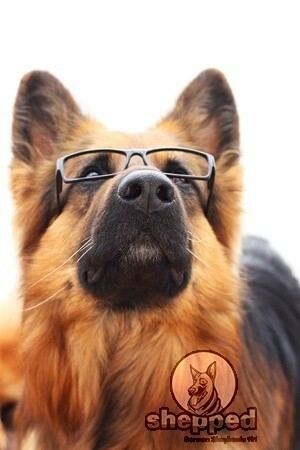 The life expectancy of the long haired German Shepherd ranges from 9 to 13 years. If you have a long haired GSD, the veterinarian can address any possible health issues and conduct a physical examination that may include blood tests, X-rays, and other tests to reach a proper diagnosis. It’s not a secret that long haired German Shepherds need daily exercise. Dog owners that already have a long haired German Shepherd or that are thinking of welcoming one into their home will be impressed at the boundless energy he or she possess. While they make excellent indoor dogs, they have to have balance and an outlet to burn off their energy. This is easily done by playing outdoor games such as fetch or Frisbee, or taking them for a walk, run or jog. Dog owners will find that the long haired German Shepherd can easily keep up with any pace of exercise and happily remains by the owner’s side. Since they also require almost constant emotional attachment to their owners, they do not make good outdoor dogs. This is good news for apartment dwellers because you can enjoy the best of both worlds, having an indoor companion and guard dog as well as an exercise buddy. Keeping a long haired German Shepherd indoors is best suited for him or her since their long hair does not protect them against weather conditions. Dog owners will want to create a safe place indoors for their long haired German Shepherd to call his or her own. This will require a bed, toys and possibly a small gate that fits in the door way and will keep the dog in a specific room or space. Dog owners can also choose to purchase or build a crate that is large enough for an adult sized long haired German Shepherd to stand up in, stretch out comfortable and turn around. While a long haired German Shepherd does well playing and exercising outdoors, their home base should be indoors. 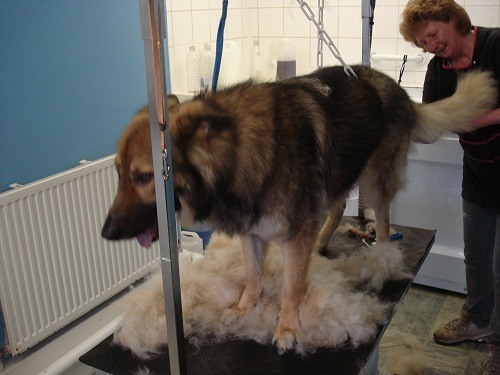 Dog owners may be surprised at the amount of hair the long haired German Shepherd sheds. Their shedding is constant so dog owners should be prepared to vacuum frequently and have lint brushes available in every clothes closet. Long-haired GSD hair tends to get matted and stuck together if it is not cared for and brushed properly. Brushing twice weekly using a metal brush is required to keep the coat healthy and tangle free. Bathing is only required when necessary. If dirt or debris from the outdoors is caught in the hair, it is wise to brush it out little by little before bathing. Beware that the long haired German Shepherds coat does not contain enough natural oils to be frequently bathed. Their ears require precise cleaning since ear wax can stick to the hair located close to the ear opening. Nail care is essential and should be done on a regular basis. Nail trimming should be done by the dog owner or a professional groomer. In addition to the nail trimming, dog owners can take their dog running or walking on concrete surfaces that will help file down the nails. Whether dog owners plan to do the grooming at home or at a groomer, they will want to get their pup or dog familiar with having their paws handled by gently touching their paws from a young age. This will reduce the risk of grooming anxiety for the dog. Since the long hair gives the German Shepherd a unique look that varies from the standard German Shepherd fans of the long haired German Shepherd, have had to fight for the breed’s acceptance. Advocacy groups are becoming increasingly popular to get the accepted so that the long haired German Shepherd can compete in competitions. The long haired GSD is loyal, intelligent, has a strong working ability and are great search and rescue dogs as well as police dogs. While the fight for acceptance continues the hope is that one day the breed will be accepted. Now that you know more about the long haired German Shepherd, you may wonder if this dog is suitable for you and your family. First, you will need to keep in mind that this dog needs plenty of human contact and attention from his or her owner and family. If you are a busy single person that is hardly ever home, or you have a busy family that is always running off to attend activities on a daily basis, this may not be the best-suited dog for your lifestyle. However, if you are a single person that needs a loving and friendly companion that will enjoy regular jogging or running sessions than the long haired German Shepherd will a great fit! In addition to having a great companion to spend time with, you will also be protected while walking, running, hiking or jogging on those isolated outdoor trails. Also if you are a family that loves spending time at home, outdoors or at the local park you will enjoy welcoming a long haired German Shepherd into your life easily. The secret is to make the dog part of your family and involve him or her in the family activities. While those who are not familiar with German Shepherds will usually believe the harsh myths they hear from others, German Shepherds are not usually aggressive. A well-socialized and trained long-haired German Shepherd is usually a family dog or companion dog that is very good with children. Although there have been reports of bites worldwide, it is usually due to lack of training by the owner or in related to a GSD protecting loved ones from harm or danger. Long haired German Shepherds are wonderful companions and family pets that will provide dog owners with many years of protection and happiness. 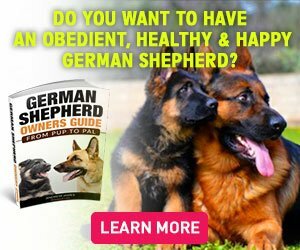 German Shepherd Owners Guide – Coming Soon!